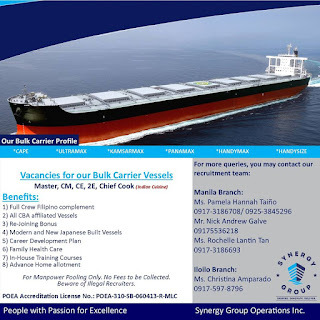 SEAMAN JOBS INFO - SYNERGY GROUP OPERATIONS, INC. IS NOW HIRING As of 26 Sep 2018 joining end of SEP-OCT 2018. - (1) MASTER (1 Logbulk). - (4) CHIEF OFFICERS (1 Kamsarmax/ 1 Supramax/ 1 Handymax, 1 Logbulk) - w/ at least 12 mos experience as CM on Bulk. - (3) CE (1 ME/ 2 MC engine experience; and at least 12 mos experience as CE) - 1 Supramax, 2 Logbulk. - (5) 2E (4 ME/ 1 MC engine; and at least 12 mos experience as 2E) - 1 Kamsarmax, 2 Supramax, 1 Handymax, 1 Logbulk. - (3) CHIEF COOK - w/ Indian Cuisine background. Makati: 3rd Floor Universal LMS Bldg., 106 Esteban St., Legaspi Village, Makati City. 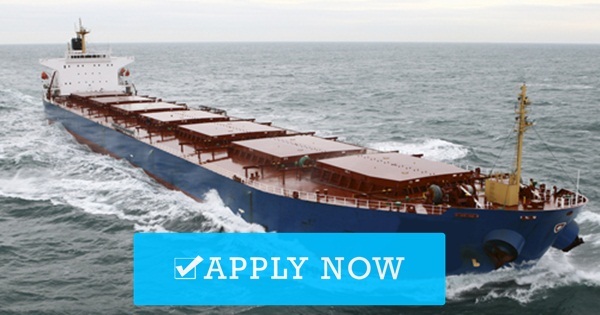 0 Response to "Hiring Crew Officers, Engineers, Ratings For Bulk Carrie Ship"